I am reclaiming my blackness. It’s been taken, twisted, and transformed into something I no longer recognized. It was deemed less than by the black kids, less than by the white kids, and left me navigating a space with an identity invalid. My mom and I had a long “discussion” about the term Blackish. This began in reference to the popular TV show, but quickly went down a road that is still painful for me to revisit. 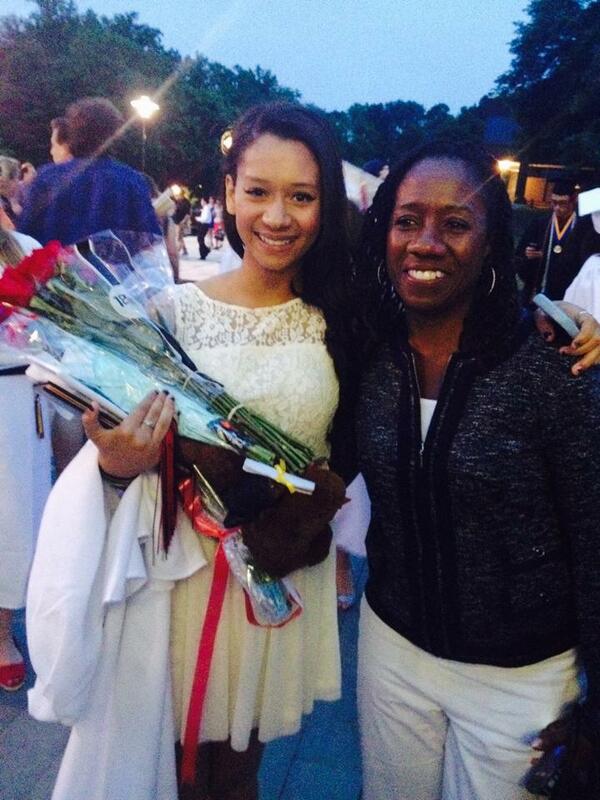 In my mom’s opinion, she is black and I am blackish. I understood what she meant. I did not fit the stereotypical “black” mold. In fact, I fit the one she built for me. Predominantly white schools, a two parent household, sports, instruments, pets, private school, a car… the list goes on. These things were and continue to be my normal. Unfortunately, these things simultaneously made me “less than black”. How could that be? My mom’s lived experiences are different. Her relationship with her dad is virtually nonexistent, she grew up in the inner city, her childhood was a low-income one. Is that what blackness is? Absentee dads? Poverty? The hood? I’ve been ruminating on these thoughts this Black History Month. I’ve been thinking of my great-grandparents who didn’t establish themselves in a hood, but a neighborhood, with a car and a home they called their own. There were two parents and they worked hard to give their children a taste of middle-class life. They wore furs and diamonds, suits and church hats. They endured overt racism in ways I will never truly understand. Were they blackish too? I am lost. I am exhausted at the thought of having to prove an identity that was handed to me. It covers every inch of my skin in a fantastic bronze hue. It dictates how strangers react to my face, my resume, my voice, my name. I am black. I am black first. I cannot be anything less. This post is an expansion of my statement in the I’m Not portion of the UMBC Women’s Center and Women of Color Coalition’s campaign for the “Telling Our Stories” project, which we posted about here. For more information about the project and other stories, visit us on Facebook here. We’re proud to announce that the Women’s Center at UMBC and Women of Color Coalition were recently awarded a $5,000 grant from the American Association of University Women (AAUW). The 2014–15 AAUW Campus Action Project (CAP) grants, sponsored by Pantene’s Shine Strong campaign, fund student led projects that fight stereotypes and biases.In addition to the AAUW CAP grant, we were also awarded a $500 community project grant from BreakingGround to help support this ambitious campaign. Women of color are blessed with so many gifts: our beauty, compassion, ingenuity and grace are unparalleled. But too often our gifts are ignored, with ruthless stereotypes and myths being built around our existence which casting us into either unthreatening or highly exoticized and eroticized roles. My first realizations about what it means to be a woman of color came, as so many realizations do, because of discrimination. Around the age of fourteen, I began receiving attention from boys and men. Many of these attentions were flattering; some were offensive and others downright menacing. But some of the most memorable comments I received were from non-POC boys and men. These comments were memorable only in their flabbergasting ignorance about what being attracted to a women of color apparently means in the minds of non-POC boys and men. Some examples: “I’ve never been with a Black girl before,” “You’re so pretty because you’re mixed—you’re lucky you only got the good features of being Black,” “I love your hair, it’s so dark,” and the jaw-dropping “I love the way your dark skin looks against my white skin.” Really dude? I came to realize that as a woman of color, you are forced by proxy to represent the exotic “other”—a taste of a world in which non-POC men dare not venture into past a certain point. Even with our own races, we can be subjugated to lesser roles because of our status as women. Yet what those who wish to make us less-than do not see is that we can be the strongest of champions: not only for ourselves, but for our people and all those who are oppressed. We are a force to be reckoned with. For me, dismantling stereotypes is so important because it gives us as WOC a chance to show that there is no “other.” We will not be your African, Asian, Latin, Native American or interracial vacation to the dark continent. We will not be a stop on your experimental college road trip for you to regale your friends about. We will not be a tourist attraction, an item on your bucket list or a milestone. We will only be us: beautiful, intelligent and independent. We will only be as strong as we have been made to be from centuries of oppression. We will continue to carry our status as WOC not as a burden, but as a gift. We will tell our stories. We will be heard. 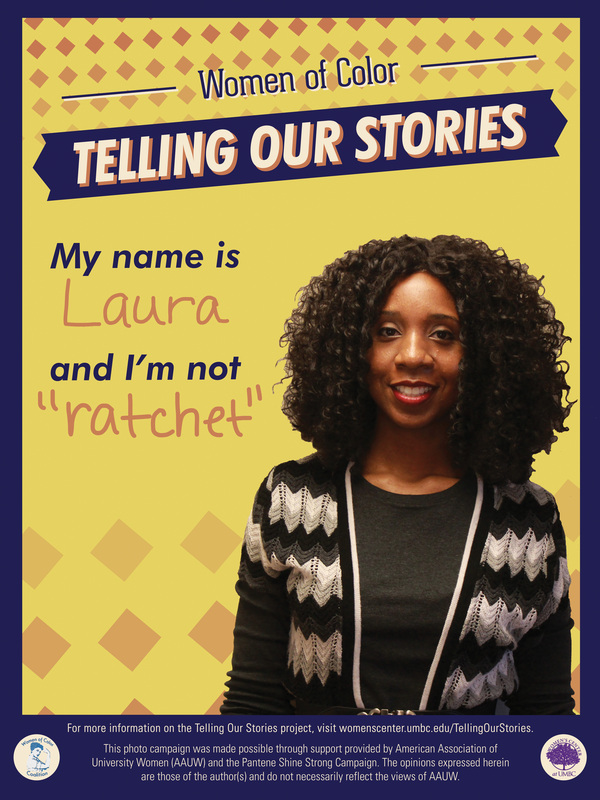 By launching the project with the “I’m Not” poster campaign, we hope to disrupt the misguided assumption that racialized gender stereotyping is not a problem for our campus community. Click here to see the latest posters from the campaign! Not only does telling your story tell people who you are but It give a different perspective of how to view things. These stories are needed and you, woman of color, have the pen in your hand ready to write it. At the end of the showcase, I don’t want the conversation of women of color telling their stories to stay stagnant. I want this to continue because there are many “untold stories” in the woman of color sphere that need to be heard. These need to be heard so that they can help heal the multigenerational hurt that women of color have accrued. I believe if we tell our stories people will understand better how to heal or not hurt us through racial interactions. The Telling Our Stories showcase will celebrate the creative self-expression of women of color and empower them to reclaim their own narratives. The showcase will be held on Wednesday, April 29th from 6:30-8:30pm in the Commons Sports Zone. Be sure to like Women of Color Coalition on Facebook and follow us on Tumblr for more news and updates on the Telling Our Stories project! This week is Critical Social Justice week!! Yay!! The Women’s Center will be occupying Main Street on Wednesday from 11am to 1pm by bringing our lounge out of the center and into the public! 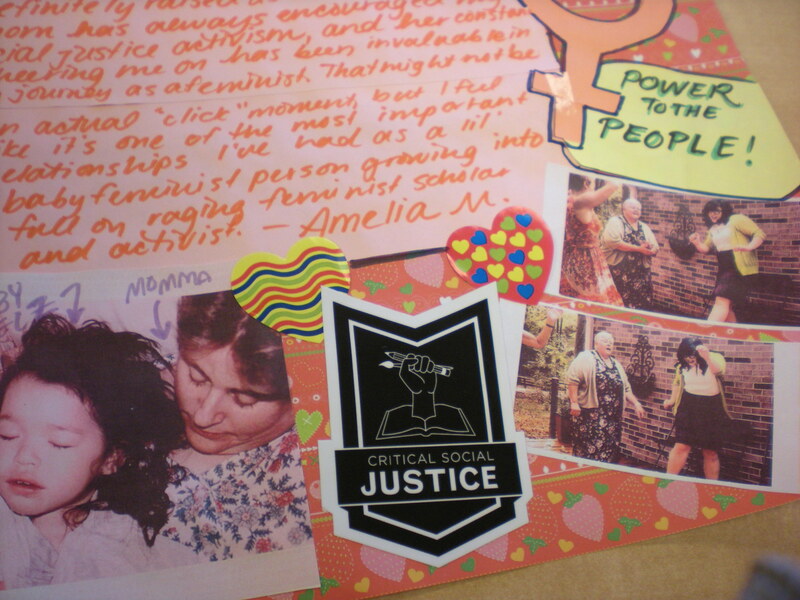 We’ll be doing a number of really cool activities including creating a scrapbook full of pages made by community members about their Feminist Click Moments. What’s a Feminist Click Moment????? Your Click Moment is the event or thought or moment when you realized the word “feminist” applied to you. Click is a book of essays about various authors’ Click Moments compiled by Courtney E. Martin and J. Courtney Sullivan. You can read an interview about the book here. Each of our staff members created their scrapbook pages for you all to see and get you thinking about how you want to express your Click Moment and add a piece of yourself to a Women’s Center project that will be available for all to see! I don’t know if you can actually be a “natural born feminist,” but I was definitely raised as a feminist. My mom has always encouraged my social justice activism, and her constant cheering me on has been invaluable in my journey as a feminist. That might not be an actual “click” moment, but I feel like it’s one of the most important relationships I’ve had as a lil’ baby feminist person growing into a full on raging feminist scholar and activist. My click moments were clouds with silver linings. It has been few years since I had my feminist click moment, and identify as a feminist. I never forget the first time that I started thinking about this more in depth, asking myself if I am a feminist or not. It was during my Gender and Women’s Studies 100 class, when our professor asked the class “ Do you identify as a feminist?” This was something that I never really thought about, I asked myself that question and after a little while my answer was “no!” I don’t exactly remember why I chose that answer. Thinking about it now, it might be because of the fact that I wasn’t really sure of how I defined feminism and what my personal understanding of it was. Later on when I was able to explore my personal identity more and define feminism for myself I realize that I was and am a feminist! I was raised to politically conscious from the start. I went to my first protest at the age of 10 with my dad and my older sister. 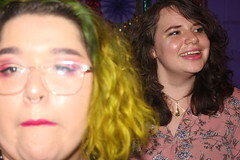 Once I realized I was bisexual at the age of 15, I began to get involved in gay rights activism by being the only student in my entire school to participate in the Day of Silence. But I never even considered the word “feminist” until I joined tumblr and a whole world of new ideas was opened up to me. 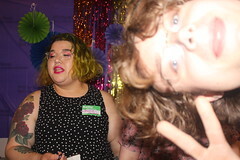 I came into my feminist identity at the same time as I was coming into my queer/trans identity and the two have always been and will forever be tied to one another. 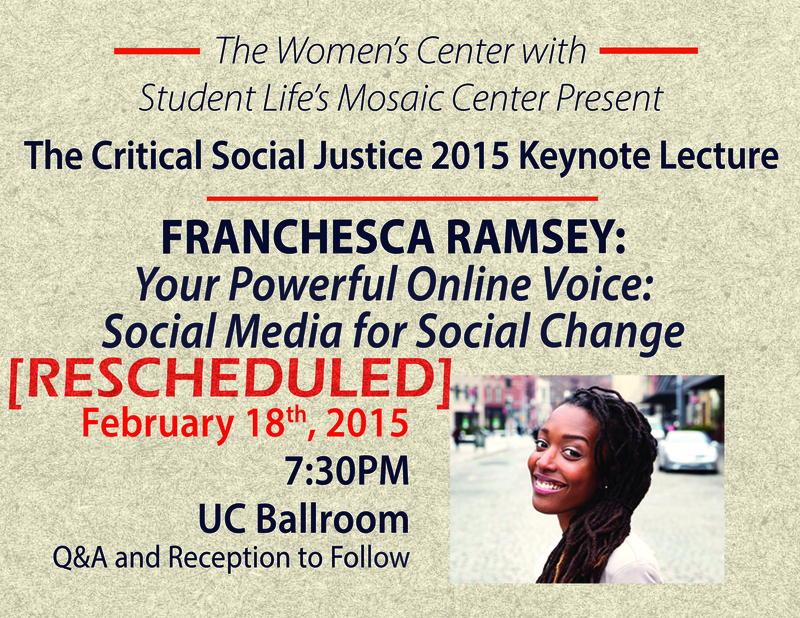 CSJ Keynote RESCHEDULED for Wednesday! Valentine’s Day? How about Galentine’s Day? This past weekend was the national holiday called “Valentine’s Day.” At its best, I think it can be a time for people to spend time together in an intentional and meaningful way. It seems that in our society, we are constantly on the run and the first thing that goes to the bottom of our lists is making time to hang out with the people we love. However, when I started to really think about Valentine’s Day, I realized that it’s often focused on the narratives of heterosexual romantic couples. Like many other holidays celebrated in our country, Valentine’s Day seems to also fall into the trap of Hallmark commercialism, and in this case, heteronormativity. You see this everywhere– in advertisements, media, and storefronts. The narrative is often focused on romantic relationships focused on men, who are often expected to get their significant other (usually a woman) gifts like flowers, chocolates, teddy bears — you know the deal. The heteronormative nature of Valentine’s Day can be incredibly limiting and isolating for other couples who may not identify similarly. Of course, in terms of gifts buying things for your partner as a token of appreciation (or because you freakin’ love them!) is not a negative thing, and it doesn’t have to be labeled as being sucked into commercialism. If you like the flowers, chocolates, etc- go for it! While romantic relationships of all kinds are great- it would be awesome to have an alternative, for example, for the people who are not in romantic relationships! This is where Galentine’s Day (a concept from the T.V show “Parks & Rec”) comes in. In the show, Galentine’s Day is celebrated February 13th and centers on female friendships. It’s a day where we get to spend time with our “gal”s and appreciate them for being in our lives! In the show, Leslie throws an annual Galentine’s Day party for her friends. In the episode, they all meet at a restaurant and Leslie “gives them all a gift bag with a bouquet of hand-crocheted flower pens, a mosaic portrait of each of them made from the crushed bottles of their favorite diet soda, and a personalized 5,000 word essay of why they’re all so awesome” (http://parksandrecreation.wikia.com/wiki/Galentine%27s_Day_%28event%29). That sounds awesome to me! I wouldn’t mind a 5,000 word essay from one of my best friends! 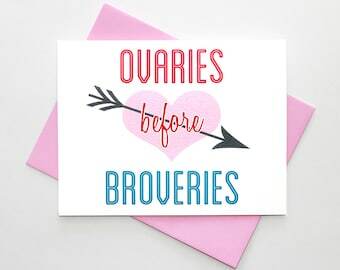 Of course, while Galentine’s Day is a wonderful event to get away from some of the heteonormative, pressured-to-be-with-someone, and commercialist system- it has some limits too! We have friends and loved ones of all genders in our lives! Even pets who we love a lot! Maybe we could make February a month of appreciation and gratitude for all of the people in our lives who have supported us. Yes, there are days for certain people in our lives (mothers, fathers, even teachers) but it’d be awesome to take time to recognize the people who have often supported us from the very beginning. This year’s Critical Social Justice Week’s theme is Brave Spaces and as the week quickly approaches, I’ve been thinking more and more about not only what a Brave Space is but what it means to be a Brave Space. The center has been implementing what we call Brave Space Guidelines as a way of creating a space that fosters learning, connecting, and understanding. There are some components of the Guidelines that are particularly salient to me as I start to consider my body and the relationship that I, and others, have to it– with the added challenge of navigating mental illness. I have, and have always had, a complicated relationship with my body. 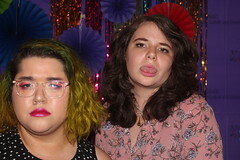 Growing up as a fat girl and eventually coming out as trans has a way of messing with the way you see yourself and the way you regard your body. Add experiences with depersonalization and derealization to that and the simple task of being a body at all becomes nearly impossible. Becoming a safe place for myself has been a life-long challenge that I continue to struggle with. Feeling safe and secure in my own skin is a rare and wonderful feeling that I think a lot of us– mentally ill or not– have a hard time with. With all the images we see and all the expectations we have for how we’re supposed to look and move and be, being comfortable with one’s body is not easy. As I meet people with similar experiences to mine and I begin to exist in spaces that are purposeful in their missions, I find myself being encouraged to become not only a safe place but a Brave Space. Intent is important, but it does not trump impact. Recognize and own the impact of your words and actions. Also, practice forgiveness and generosity: remember that this is a space where we are all learning and growing. Recognize and respect the range of emotions that you and others may experience...be thoughtful about how your emotions and behavior may impact others based on their experiences. Recognizing the uniqueness and value of individual experiences has helped me see others as complex individuals who have stories and experiences that I can learn from. It helps me remember that trauma and mental illness looks different for everyone and allows me to be more open to these differences. Intent over impact is incredibly important. While mental illness can be an explanation for behavior, it is never an excuse. The effects my actions have on others or the effects the actions of others have on me are valid and important and shouldn’t be dismissed because of mental illness. Practicing forgiveness and generosity– for others and especially for myself– is the most difficult and most important lesson I am still struggling with. I am still learning and I will make mistakes. This does not make me a bad person nor does it decrease my value. Others will make mistakes and I need to acknowledge when they have made personal growth and change. People are inherently good and all people are capable of positive change. Emotions can be difficult to deal with, especially when you’re constantly told that you’re overreacting or “just crazy.” The way I feel about something is true to me and important even if it is different from how someone else or even most people feel about it. I can’t even begin to express how much these three guidelines have shaped the person I am now and the person I am still trying to be. Being a Brave Space for myself and for the people around me requires conscious effort and it’s not always easy, but it’s helped me be kinder to myself and others feel safer in my presence. I can trust my body to sustain and support me and it can trust me to be gentle and work towards positive change in return. Facebook and I celebrated our 10th year anniversary this winter. I remember one of the first times I logged onto my account late in the fall semester of my senior year with my roommate hovering over me. What picture would I use for my profile? I picked a great one of me wearing my favorite sweater at my ½ birthday celebration at the Melting Pot. And that was it. There were no walls to write on, albums to upload, or even then people to “poke,” and there was certainly no invites to Candy Crush. When I think back to all that Facebook wasn’t, I can’t believe we made it past those first few log-ons.